The union health ministry is finalising the national antibiotics policy to check indiscriminate use of drugs. The move comes close on the heels of the detection of multi-drug resistant bacteria, dubbed superbug, in foreign patients who underwent treatment in India and Pakistan; it was reported in The Lancet Infectious Diseases in August. The ministry has constituted a 13-member panel to give suggestions on the policy and its implementation. “There is an urgent need for such a policy because of irrational prescription and overuse of antibiotics. People are developing resistance to drugs and do not respond to treatment,” said Ranjit Roy Chaudhury, chairperson, Apollo Hospitals Educational Research Foundation, and a panel member. Other panel experts indicated the new policy would apply to both public and private health sectors. Antibiotics would be categorised as non-restricted, restricted and very restricted; each category would have a distinct colour code for the benefit of consumers. The policy would include a list of antibiotics that cannot be sold without doctors’ prescription. At present, many of the drugs prescribed, especially by private practitioners, are not in India’s essential medicines list comprising 354 drugs. There would be curbs on doctors. They would have to follow standard treatment guidelines. They would be allowed to prescribe only selected antibiotics. If needed, the doctors will have to justify the prescription of these drugs to hospital committees and drug and therapeutic committees that will monitor them. Stringent penalties will be imposed on errant doctors. It is not clear how prescription of drugs in private hospitals will be monitored. Public health experts said the policy should address key concerns like doctors prescribing medicines by brand names. “It is not just antibiotics, even anti-retrovirals and anti-malarials are generally mis-prescribed or over prescribed,” said Leena Menghaney, a lawyer working on hiv, public health law and policy. She said the main reason for irrational prescription is that doctors earn big profits from pharma companies that produce branded drugs. Some of the over-prescribed antibiotics include fluoroquinolones. The private medical community is prescribing fluoroquinolones as first line of treatment which increases chances of the patient developing resistance to this class of drugs. Resistance to the fluoroquinolones reduces second-line treatment options for drug-resistant TB, which is increasingly becoming a public health challenge, Menghaney said. 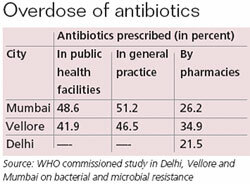 A who study carried out in 2004 in Vellore, Mumbai and Delhi confirms this. It said antibiotics like fluoroquinolones and cephalosporins are prescribed more in the private sector where doctors also prescribe newer and more expensive antibiotics. In contrast, doctors in public health institutions prescribe older and less expensive antibiotics like cotrimaxazole and tetracylines (see table: ‘Overdose of antibiotics’). The policy will also provide for monitoring prescriptions through chemist shops. Doctors would be required to give two sets of prescription to patients—one for the patient, the other for the chemist. The policy should also look into over-the-counter sale of drugs without doctors’ prescription, said Chinu Srinivasan of Low Cost Standard Therapeutics, a non-profit and small-scale pharma in Vadodara city in Gujarat. Another expert panel member who did not want to be quoted said surveillance would be a significant part of the policy. “A system would be in place to monitor the magnitude of use and resistance patterns,” the member said. A multidisciplinary national task force would be set up to coordinate and implement strategies for antibiotics overuse, she added. The suggestions that the experts have sent to the panel also include pharmacovigilance programmes. This would include collecting, monitoring, researching, assessing and evaluating information from healthcare providers and patients on the adverse effects of medications, biological products, herbs and traditional medicines. Apart from doctors’ prescriptions, the antibiotic policy will also deal with the use of drugs on livestock, poultry and honeybees (See ‘Daily dose’, Down To Earth, September 16-30, 2010). The draft policy is likely to be ready by November-end.